Realize your dreams and live, not your fears. Life's too short to worry about the opinion of others. 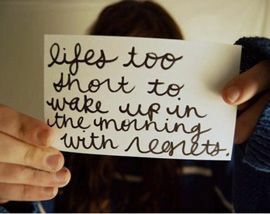 Life is to short to contradict our personal weakness, crib about our assets and shed tears for things we can't change. Surround yourself with the people who make you happy and laugh so hard that you forget all the bad and sad things, and focus solely on good. After all life is too short to be anything but HAPPY. Life is too short to spend at war with others. Practice acceptance and forgiveness. Don't let dumb little things break your happiness. Surround yourself with the people and things that makes you happy, forget the bad, and focus on the good. Life is too short to be anything but happy. Remember that life is too precious to be wasted on selfish people who have no desire to help anyone but themselves. Life is too short not to love it with all your heart. Cherish every moment, be kind to yourself and appreciate everything you do. Life is short take risks, love someone, pray daily, make as many great memories as possible, laugh often and be accomplished. Whether we choose to see it or not, our life is too short to worry about small things. Though some circumstances in our lives at the moment may seem fairly significant, we must realize that the things that are really important are the things that are going to matter in ten to twenty years, or twenty to fifty years. Life is too short to sweat the small stuff. We have to choose to live our lives in the present and for the future, instead of trying to live in the past. We must also live our lives doing the things and for the people that we are passionate about. Living a life without passion, and without hope for the future is not really living your life at all. Remember that the next minute, hour, and day are not promised to you, and may be taken from you at any time. Never let anything or any person stop you from pursuing the things that you are truly passionate about pursuing.